The Lions ‘Message in a Bottle’ is a simple idea that encourages people to keep their basic personal and medical details including a list of the medication they are taking or a repeat prescription form in a common place at home where these can easily be found in a medical or other emergency. Your information is kept on a sheet of paper provided in a plastic bottle in the fridge and the bottle comes with two labels – one to be displayed on the inside of your front door or the main entrance to your home and the other on the door of your fridge. Why keep the bottle in the fridge? Because it’s the last thing that burns in the event of fire. ‘You don’t have to be old or infirm to be unwell. For your local ambulance service having access to a ‘Message in a Bottle’ in a patient’s fridge can be a real lifesaver. When a patient is in pain or distressed the last thing they need is to be quizzed about their life. Often we have to waste valuable time in rummaging around for a patient’s medication, time that could be much better spent in getting them definitive care at hospital. The Lions ‘Message in a Bottle’ is FREE from your local Lions Club. 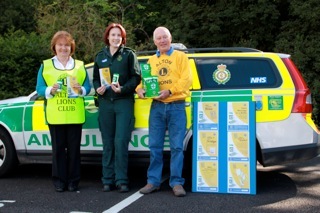 To order yours please email miabcenorder@lions.org.uk or telephone 0845 833 9502 for details of your local Lions Club.